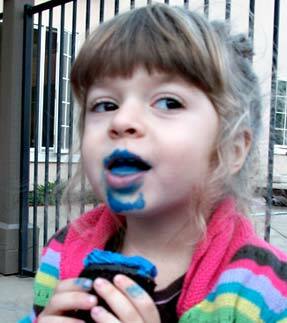 Enjoying birthday party cupcake in a color not found in nature. If there’s one thing I look forward to (besides a Dora marathon) it’s hitting the birthday party scene. I’m not ashamed to say I like to party. I party HARD. One memorable birthday bash I attended had a bottomless make-your-own-cupcake bar AND a bouncy house. On the ride home I barfed all over myself. Luckily my goodie bag was unscathed. Good times. While my mom’s social life has dwindled to almost nil, mine is a flurry of soirees. (Thanks to the preschool “invite the whole class” mandate). Your dance card filled? Here’s how to maintain some composure at your hottest social events, even if you’re hopped up on sugar and you’ve missed your nap. You might think it’s “cool” or “hip” to show up to a party sporting your peed-on jammies from the night before, but that is just plain tacky. Also, swimsuits are only appropriate for swim parties. And, please, before you get yourself all revved up for a marathon stand-off with your mom, remember, clothes are NEVER optional party attire. Don’t give in to temptation and shove a handful of cake in your mouth, blow out the candles yourself, or wipe your boogers on the forks. That kind of bad behavior is sure to make your friend burst into tears and inevitably an adult will demand “The Apology.” Think about it. Do you really want to deliver a forced “sorry” with a face full of ill begotten frosting? When bringing a gift to a party, be sure to politely hand it over to the birthday boy or girl upon entering the festivities. No grabbing the box, shrieking “It’s mine!! !” and running out into traffic. … or, for that matter, drink under the table. Yes, the juice boxes will be flowing, but are you going to want to stop what you’re doing to get to the potty? If you’re not yet potty trained, it’s good form to go easy on the liquids — nothing will make you feel less like a “big boy” than being carted out like a giant baby for a diaper change. Generally those little goody bags are filled with useless items that your friend’s parents threw together at the last minute — an assortment of choking hazards and lead-based painted toys. Upon entering the car to go home, simply dump the contents of the bag on the floor. That way you’ll always know where they are. Do try to coincide your exit with your nap time. But if you absolutely can’t put your meltdown on hold, at least try to refrain from punching, kicking, and biting as you’re dragged out by your arm. Remember, your friend will have another party next year — and you don’t want to be left out. Make a good impression. Don’t be a douche. My daughter turned 4 yesterday… I can totally relate. We are celebrating her b’day on Sat with a small party. I full anticipate I will battle all of these issues. And the icing color… where does it come from? I mean there are the most vibrant hideous colors… and they don’t come out of pink frilly dresses. I know! Very astute and mature advice, Lily! Lily, As always you make me laugh. I had a cupcake like that electronic, fry my guts, cancer blue dye not too long ago too. Wasn’t it delish? Too bad it took 15 baths for my mom to get it off my face. Anyway, I’ll take all your suggestions to heart. Especially since some of my most memorable and award winning meltdowns occur at birthday parties. I need a wing woman for my next party. Are you available? Yes! Thank you for this. My foray into the party scene has only just begun. Now if you could just publish a companion piece for my mom…the few parties I’ve been to, she _inevitably_ screws it up for me. this list is going out with my next set of invites!! Don’t be a douche is my FAVE!!! Hmmmm, I’m making notes to not follow a cupcake buffet followed with bouncy house jumping! You poor thing. This TOTALLY explains why my brother got kicked out of 5 parties in a row.